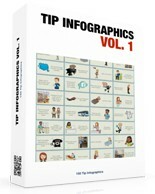 50 infographics (.PNG) in three styles for a total of 150 designs. This product was added Aug. 2017 and has been checked for accuracy and scanned for viruses. Your satisfaction is guaranteed!